- Latha M. Chamarthy, M.D. Compassionate and Quality Care by Board Certified Allergists where Patients and their Families Come First. Dr. Chamarthy and Dr. Sanka welcome you to our website. Home » Rima Sanka, D.O. 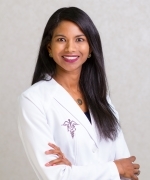 Dr. Sanka is a fully licensed, board certified allergy, asthma and immunologist trained and educated in the United States. She completed her Internship and Residency in Pediatrics at University of South Florida/All Children’s Hospital in 2005. She completed her Fellowship in Allergy and Immunology at University of South Florida/All Children’s Hospital in 2007. She published research about red tide, aeroallergies, and primary immune deficiency during her fellowhip. Serving as a distinguished lecturer at several state and local conferences, she is well known in the medical community. Dr. Sanka is originally from upstate New York and attended Cornell University (‘97). She spent a year volunteering with the AmeriCorps in Washington DC, after which she attended medical school at the Philadelphia College of osteopathic medicine, graduating in 2002. She is married with a son and daughter. She lives in Tampa and enjoys outdoor sports and traveling in her free time. Dr. Sanka maintains an active interest in teaching medical students, residents and fellows in addition to patient care. 10/08/07 American Board of Allergy and Immunology Certification Examination #2007005440. Expires 2016. 10/8/07 American Board of Allergy Asthma and Immunology Certification Examination, Expires 10/2018. 2/15/06 State of Florida Unrestricted Medical License. 6/13/07 DEA and Controlled Substance Registration Certificate. 11/04 -7/07 All Children’s Hospital, IRB approved research project “The Effect of Red Tide Exposure on Nasal Cytokines”, Co-investigator. 1/96-8/96 National Institutes of Health, National Cancer Institute. Mentor: Dr. Birandra Sinha, PhD. and in a mouse model. MD. PhD. Administered pediatric endocrinology human protocols for Cushing syndrome. 8/08 Grand Rounds lecturer “Asthma and Red Tide” to pediatricians and residents at All Children’s Hospital. 6/08 Suncoast Annual Conference lecturer “Asthma and Red Tide” Tradewinds Resort, St Petersburg FL. 5/08 Asthma Family Day speaker “Asthma and Red Tide” to patients and their families at All Children’s Hospital. 10/07 Primary Author, “Complete DiGeorge Syndrome Associated with CHD7 Mutation” published in Journal of Allergy and Clinical Immunology, Letter to the Editor, Oct 2007. 6/07 Fellow Speaker, “Red Tide: What the Allergist Needs to Know” Florida Allergy Asthma and Immunology Conference. 2/07 Poster and Abstract, “Complete DiGeorge Syndrome Associated with CHD7 Mutation” American Academy of Allergy Asthma and Immunology Annual Conference – San Diego, CA. 11/06 Poster and Abstract, “Sweet Syndrome – The Youngest Case” American College of Allergy Asthma and Immunology Annual Conference – Philadelphia, PA.
3/06 Poster and Abstract, “An Unusual Case of Neurotoxic Shellfish Poisoning” Academy of Allergy Asthma and Immunology Annual Conference – Miami, FL. 7/04 Article, Sanka, Kumar. “An Unusual Newborn Rash” Fetal and Pediatric Pathology. Vol 23/Issue 4. Pediatrics National Conference – New Orleans, LA. Patients” World Allergy Organization Conference – Vancouver, BC. Institute, National Institutes of Health Poster Symposium. 7/99-8/99 Christian Medical College – Vellore, India. Delivered health care in mobile clinic vans to families with limited or no access to a hospital. provide public safety, immunizations, and cleaner environments for inner city children. 11/06 American College of Allergy Asthma and Immunology Meeting, Philadelphia, PA.
3/06 American Academy of Allergy Asthma and Immunolgy Meeting, Miami FL. Proficient in Spanish and Telugu speaking. Skilled in Power Point, Sigma Stat, Excel.